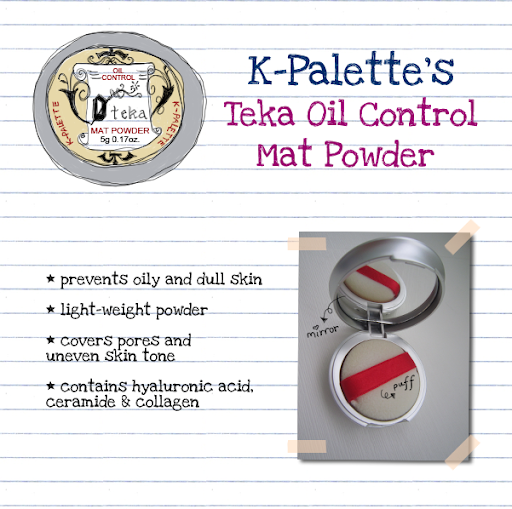 What is this Teka Oil Control Mat Powder? It is an oil blotting powder! To keep the oilies away! The powder is housed in a round plastic tin which is slightly smaller than a palm. It has a mirror and comes with a puff, making touch ups very easy and convenient! What does the powder contain? Does it provide any coverage?!? How does the powder feel on your skin? So... How does this compare with Urban Decay's De-Slick Mattifying Powder? For those who hate the smell of tea tree oil, the K-Palette one will be good for you!